Lady Niguma - lifechangingretreatss Webseite! everything becomes a land of gold, my child. (and all of the five paths and ten stages). This, through the power of devotion! 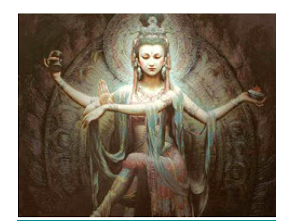 The goal of Lady Niguma's yoga is to eliminate the blockages at the nodes (chakras). In the body there are 72,000 channels of light, these are physical and consist of very subtle matter or force that is not visible. The Prana flows in these channels. Other names for Prana are Lung / Chi / Inner Wind or Energy. Prana is necessary for the body to perform functions such as thinking, speaking, breathing, functioning etc. Sushumna (central channel), Ida and Pingala. The central channel (the channel of wisdom,color. sky blue) is located in front of the third eye, in front of the spine and extends to the pelvic floor. Pingala (also called sun channel, male assignment, color: milky red) flows to the right of the central channel, down to the legs. Ida (also called moon channel, female assignment, color: milky white) flows to the left of the central channel, down to the legs. 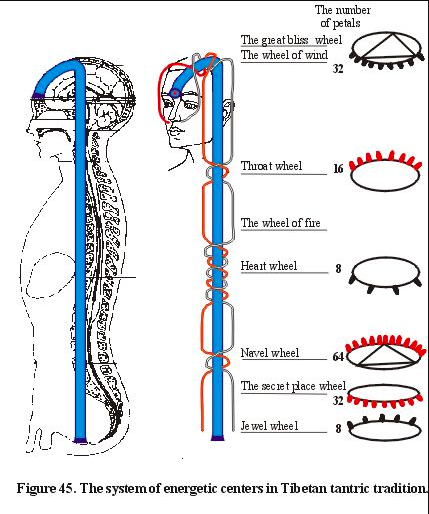 knot around the central canal at the at the top of the skull, level of the third eye, at the level of the neck, three times at the level of the heart, at the level of the navel and coccyx and join together on the pelvic floor. An old Tibetan teaching saying: "lung sem dschug pa tschig pa", which means: Prana and thoughts are like horse and rider, they ride as a unit. Where our thoughts go, the prana must flow and vice versa. Ida, Pingala and the central channel flow into each other at the pelvic floor. Since there is a limited amount of Prana, Prana always flows in only one channel. When we get angry, upset or jealous, Prana flows into Pingala. If we feel false desires and are marked by ignorance, Prana flows in Ida. When Prana flows in the Central Channel, we have thoughts of kindness, wisdom, and deep understanding. when all Prana is in the central channel, the river of Prana stops immediately and also the breath stops because it will not be necessary anymore. The body is nourished by love and wisdom and no longer by air, food and water. When the heart chakra opens, one experiences ultimate love and one sees all living beings in all worlds and one loves them all at the same time. The body turns into light and you gain the ability to multiply, to be able to help all living beings simultaneously in all worlds. This is ultimately the goal of all yoga teachings.